How or where to buy items? We deliver CAD-data, only. We do NOT sell any hardware! How do I recognize my position at directory level and how can I change to another level? How can I filter for certain variables in the table view? Use the filter, especially for parts with many rows (characteristics), in order to minimize the number of displayed rows. Make sure that your are in the dialog area 3D CAD CATALOGS and search for the required part. At directory level select product groups as long as a concrete assembly or concrete single part has been specified and choose an assembly or a single part. For tables with many values (columns) switch into Full screen mode by clicking on the icon . -> By clicking the icon you return to the standard view. Click on the filter symbol in the column header of the respective variable with which you want to filter. -> The dialog area with the Filter settings opens. Make your preferred settings. Then click on Apply to confirm your entries. -> If you want to change your entries click on Reset. If you want to return without changes click on x. 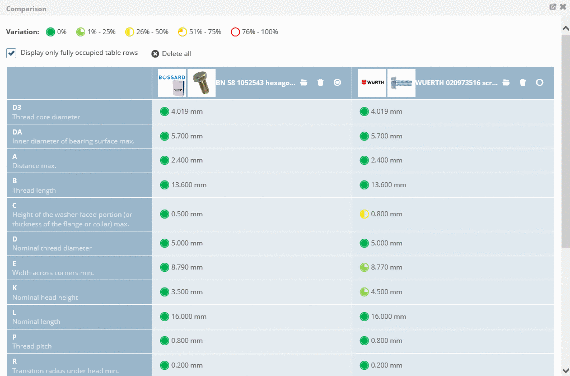 -> Only CAD models are shown which correspond to the filter settings. In order to delete the filter settings, click on Remove all filters. Why do I get the error message "No valid ticket" and what can I do? You probably have reached the daily download limit or you are not activated for the download. Please contact the support of the partner portal directly. Why do I get the error message "E-Mail not allowed" and how can I solve the problem? Alternatively you can also try to use a different browser. Contact your local IT for help changing settings if necessary! If the proposals do not work please contact the support of the partner portal directly, because sometimes Free mail addresses like abc@gmx.de are blocked by our partner portals. How can I send the chosen CAD model to my e-mail address and import it into the CAD system? Follow the steps listed below to send a CAD model to your e-mail address. 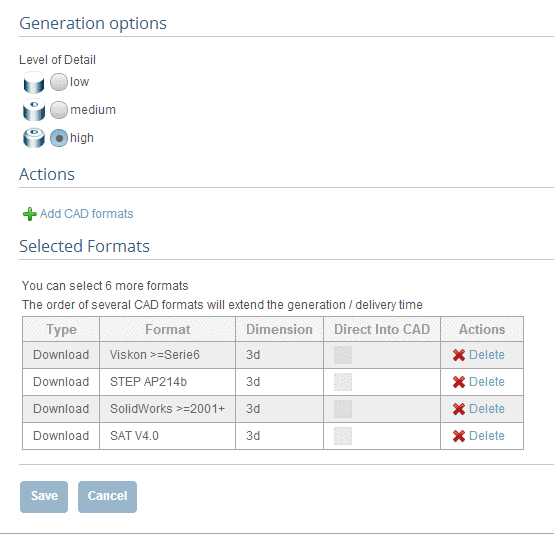 Make sure that you are in the dialog area 3D CAD CATALOGS and navigate to the required part. 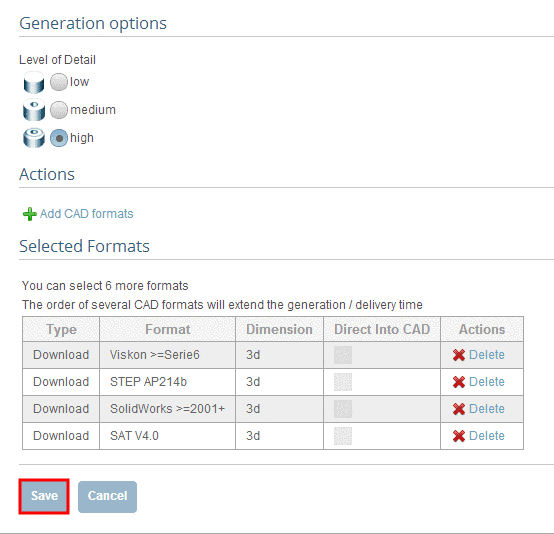 In the dialog area Download CAD models under Edit CAD formats -> Add CAD formats, select the transfer mode email by clicking into the option field. Then define one or more CAD formats and confirm your entries by clicking on Save. -> The view returns to the dialog area Generation options / Selected formats. Confirm your entries by clicking on Save. Under Actions, click on Generate CAD MODEL. -> The information dialog Generating CAD models opens. All formats selected under Download CAD models (dialog area 3D CAD CATALOGS) -> Edit CAD formats ->Selected Formats are generated. As long as the generation is running, is shown. As soon as the generation has completed, you will get informed by the note Check your emails that the component was sent by e-mail. If you close this window, further CAD models can be selected. Furthermore all generated CAD models are listed under Download CAD models. Remove: By clicking on the link you can remove parts from the list, which are no longer needed. Generation not successful. A corresponding error message shows up. 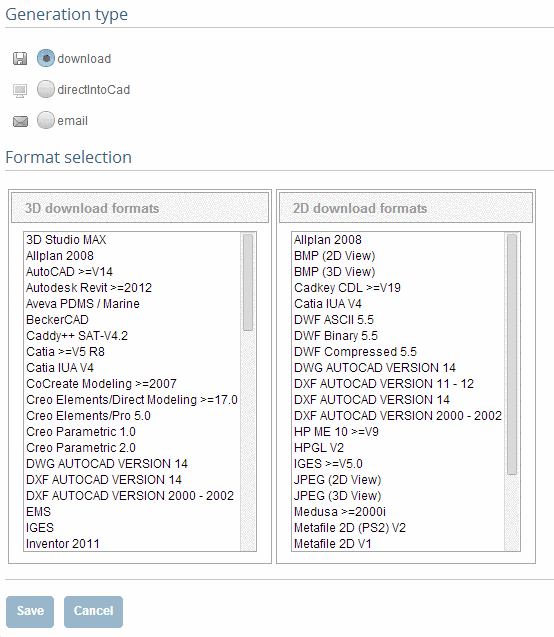 All formats activated under Download CAD models (dialog area 3D CAD CATALOGS) -> Edit CAD formats -> Selected formats are generated and listed here now. 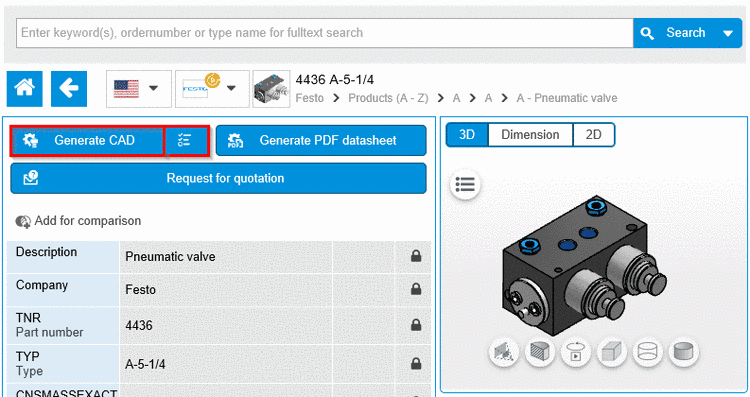 For some formats you can get some CAD specific information by clicking the Info-Icon . The same Info icon you can find underDownload CAD models -> Actions. to overview all currently available models. Temporarily save the attached ZIP file anywhere. 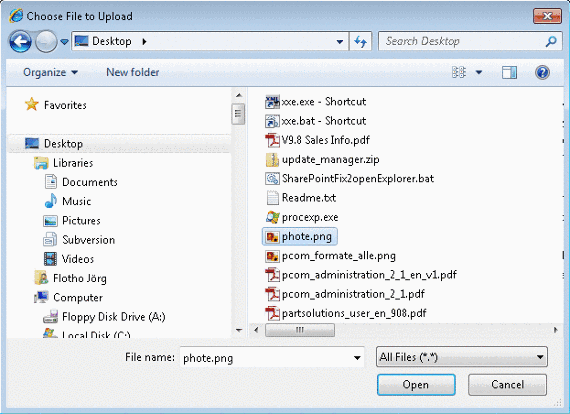 Unpack the files with WINZIP or a similar program. Import the file into your CAD system. For some formats, you can receive some CAD specific information by clicking on the Info icon under Formats. Why is my emailaddress blocked? You are using an emailaddress from a freemailer? are generally blocked for security- and/ or costsreasons by some catalogsproviders. Other providers enable the download generally after emailauthentification.
! If you want your emailaddress to be unblocked please contact the catalogprovider directly ! at your site. Please make sure, that *cadenas.de and (!) *partserver.de and (!) *partcommunity.com is listed under "trusted sites" in your browsersettings! How can I directly integrate the chosen CAD model into the CAD system? In the dialog area Download CAD models under Edit CAD formats -> Add CAD formats, select the transfer mode directIntoCad by clicking into the option field. Then define the CAD system and confirm your entries by clicking on Save. 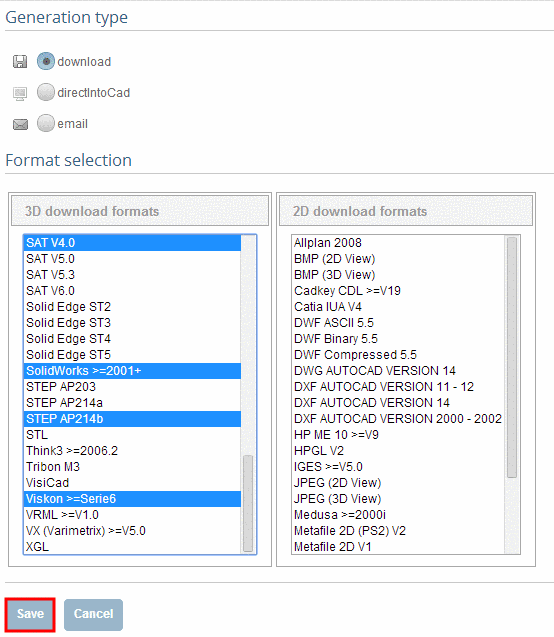 All formats activated under Download CAD models(dialog area 3D CAD CATALOGS) -> Edit CAD formats -> Selected Formats are generated and listed here now. 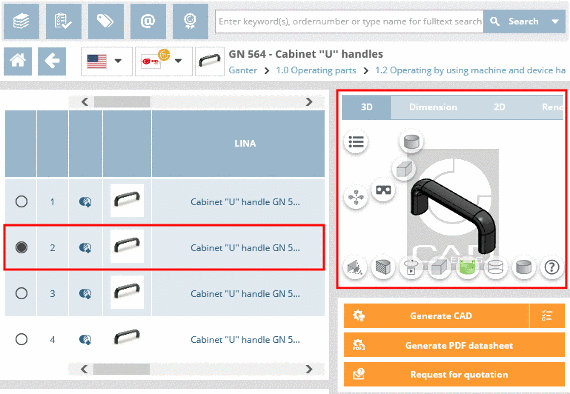 As soon as the generation has completed, you can submit the CAD models to the CAD system in this window directly by clicking the link Direct integration. Remove: By clicking on the link you can remove parts from the list, which are no longer required. 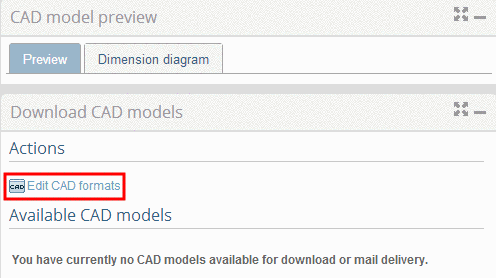 -> For some formats you can get some CAD specific information by clicking the Info icon . The same Info-icon you can find under Download CAD models -> Actions. 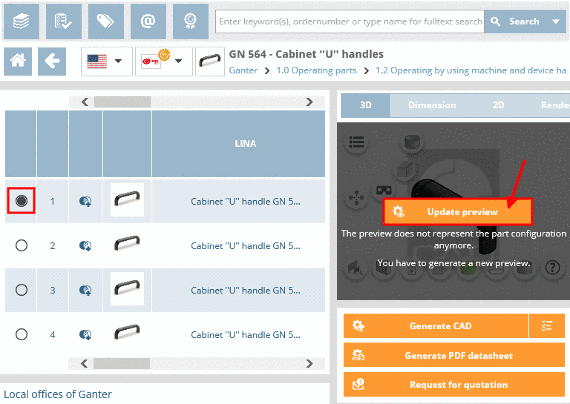 Click on the link Direct integration or the symbol , in order to load parts into the CAD system. The application component PART2cad is required at the workstation when using direct integration. Install it during the first run. The necessary installer opens automatically. The installer itself needs Java. -> Once Java is installed the PART2cad installation will start. If Java is not installed, there will be no Java logo displayed. In this case click on the link Click here and install Java. -> Warning messages may show up. Let the component PART2cad install. During the first run the direct integration PART2cad will be downloaded. Following runs will open the dialog Transferring model to CAD. No user interaction is necessary. Please note the following selection dialog for the version name of the CAD system. In the drop-down menu select the CAD version where the model is to be transferred. Confirm the selection with Choose. Keep in mind that the CAD system has to be started. -> A dialog box "Export ..." is opened to select the destination directory. Select the preferred destination directory. Use ... to browse. Confirm your entries by clicking Ok.
-> The model is transferred to the CAD system. When the transfer to the CAD system is finished a message will be shown.Please note the following selection dialog for the version name of the CAD system. -> The part has been imported in the CAD system. If the CAD system is not started or the wrong version was chosen, an error message will be shown. How can I download the chosen CAD model and import it into the CAD system? In the dialog area Download CAD models under Edit CAD formats -> Add CAD formats, select the transfer mode download by clicking into the option field. 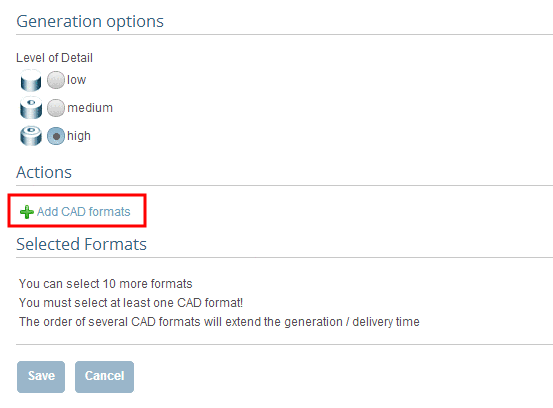 Then define one or more CAD formats and confirm your entries by clicking on Save. Under Actions click on Generate CAD model. 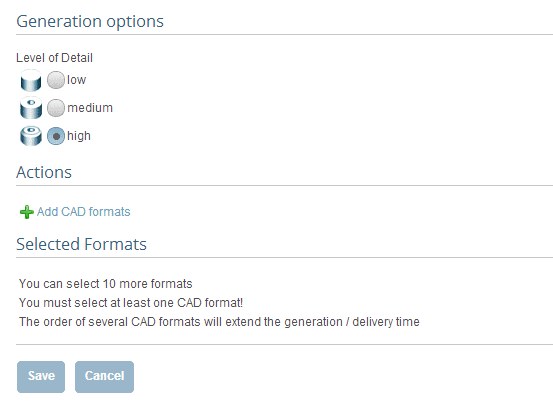 -> Edit CAD formats -> Selected Formats are generated. As long as the generation is running is shown. As soon as the generation has completed, the CAD models can be downloaded in this window directly. For this click on Download. Info: Specific part informations (see the next point). The same Info icon you can find under Download CAD models -> Actions. to overview of all currently available models. Click on the Download link or the symbol . -> The File download window opens in order to determine the storage location. For some formats, you can receive exact CAD-specific information by clicking on the Info icon under Formats. How can I receive a 2D preview of my chosen CAD model? Dimension diagram tabbed page shows the 2D views. Always a default dimension view is displayed (created for a middle row) and this may differ from your selected part. Under Actions click on Dimension diagram to get 2D views of the chosen part. 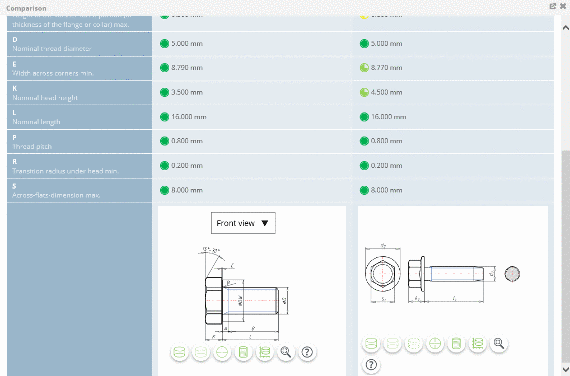 By clicking on a Preview you can select the desired dimensioning view. By clicking on Dimensioning views again you can hide the preview selection. In the toolbar, move the mouse pointer over the icons in order to receive information about the icons. How can I change the level of detail of the CAD models? Under 3D CAD CATALOGS you have the possibility to define the level of detail. Make sure that your are in the dialog area 3D CAD CATALOGS. On the right side under Actions, click on Edit CAD formats. Define the Level of Detail. The setting refers to the CAD model. The display in the 3D view is always "high". Confirm your entries with Save. -> The level of detail has been changed. The required catalog is not available - what can I do? Make sure that you are in the dialog area 3D CAD CATALOGS and then search for the required CAD model. Click on the link Nothing found?. Click on Submit in order to send your preferred catalog. How can the geometric search be carried out (based on a catalog part)? 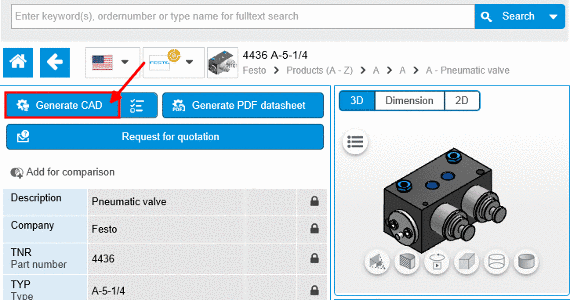 Make sure that you are in the dialog area 3D CAD CATALOGS and search for the required part. At directory level select product groups as long as a concrete assembly or concrete single part has been specified. 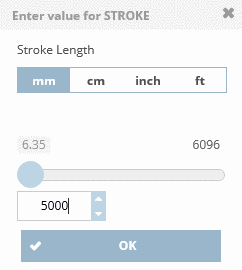 Select the desired part by clicking into the option button before the desired row. -> The similar parts found are listed in the dialog area Results. How can I adjust the value range fields in the variable view? Some parts contain value range fields. In order to completely specify the part, a selection must be made in the value range fields. The settings are made in the Variables section. Click on the part description in order to reach the variable view. -> You will recognize the value range fields based on their yellow background color. Using the arrow open the value range field and select the desired value. Then select the desired value. Enter the desired value manually or set it using the slider in the given area. 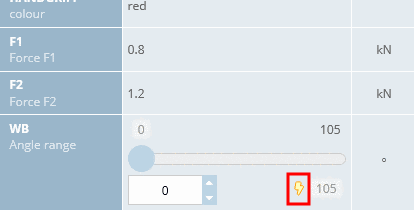 Inputs outside of the allowed value range are automatically corrected. Some catalogs support images for variant selection. Click on the image in order to set another value. 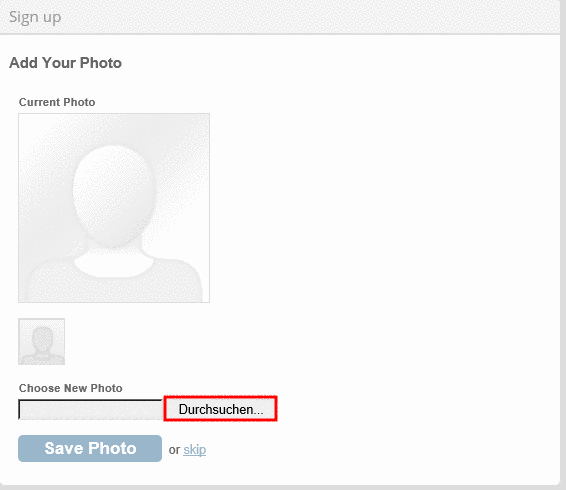 -> A dialog opens for choosing the characteristic per image. Select the desired variant by clicking on the image. -> It is reloaded into the variable view. If you do not want to take over the changes, click on x. The part is now completely specified. How can I define the characteristic of the part? Define the characteristic of the part, by clicking into the option field of the desired row. -> A default view of the selected model which may differ from the selected characteristic, is displayed under CAD model preview. If you want to view an exact replication of the characteristic, under Actions click on Generate preview. Switch to the variable view by clicking on the part description. The variable view shows all important data of a specific characteristic in a compact form. -> Click on Back to return to the table view. For parts with value range fields, the variable view helps allocate the values. How can I generate a PDF datasheet? 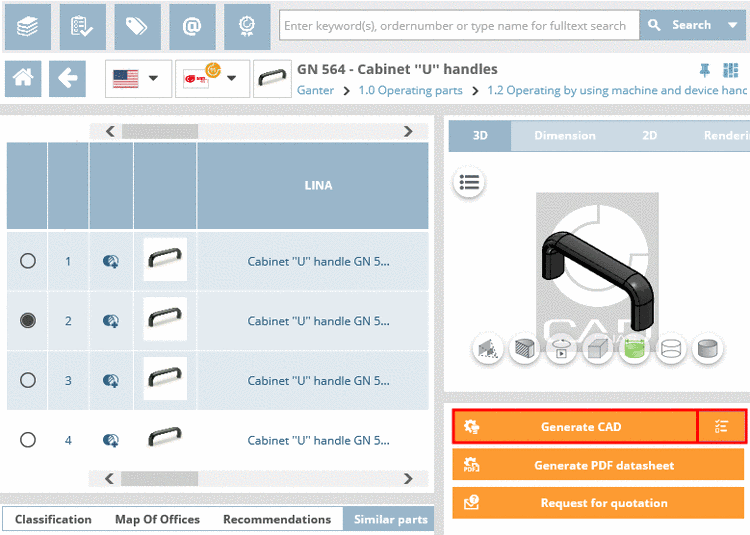 Make sure that you are in the dialog area 3D CAD CATALOGS and select the desired catalog. At directory level select product groups as long as a concrete assembly or concrete single part has been specified. -> As soon as a concrete row has been determined, a 3D view and dimensional drawings are loaded under CAD model preview. Under Actions, click on Generate PDF datasheet. The information dialog Generation CAD models opens. If the CAD model shall be generated in several formats under Format selection there is the possibility to choose the format PDF Datasheet additionally. By holding down the CTRL key, you can make multiple selections. The information dialog Generating CAD models opens. -> The generation was started. Generation successfull. Part ready for download. The pregenerated 3D PDF corresponds to a sample part (created for a mid-row with standard setting) and may differ from your selected part. How can I request charges and delivery date at supplier? 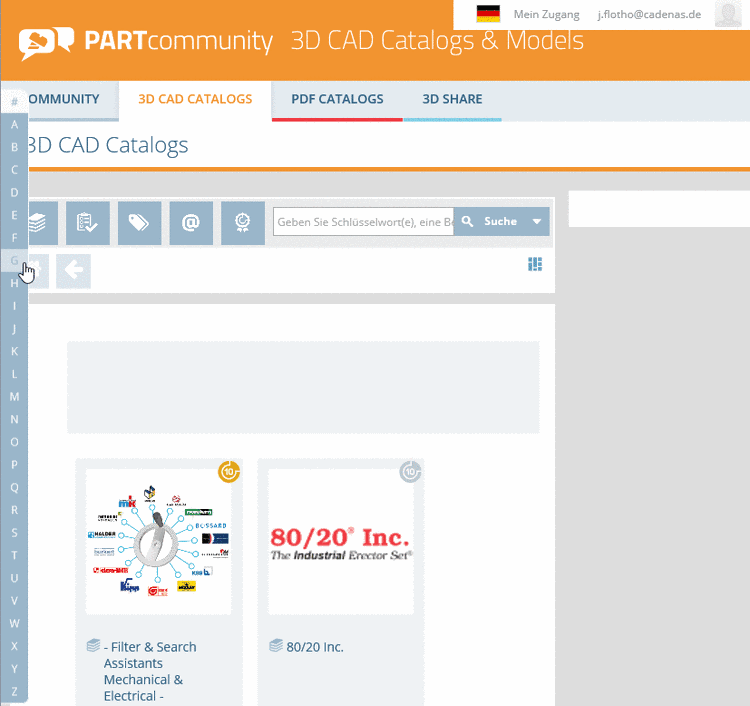 Make sure that you are in the dialog are 3D CAD CATALOGS and select the desired catalog. Under Actions click on Request for quotation. -> The dialog for inputting your quotation request opens. Fill in the input fields completely and click on Send request, to send the request. In order to get a preview of your enquiry click on Preview request. -> A dialog box with a preview of the request opens. As soon as the e-mail was sent, you will receive the confirmation Email has been sent successfully. How can I define the generation type? Under 3D CAD CATALOGS you have the possibility to chooses CAD formats and to define the handing over mode into the CAD system. 1. Make sure that you are in the dialog area 3D CAD CATALOGS. 3. Click on Add CAD formats. -> The settings area for Generation type and Format selection opens. 4. First determine the desired generation type. Click into the desired option field. -> In the dialog area Format selection select a format or several formats. -> The view changes back to the dialog area Generation options / Selected formats. In the dialog area Selected Formats you can see your current selection. In addition to that under Actions you can define the Level of Detail. 6. Confirm your entries with Save. How can I receive a 3D preview of my chosen CAD model? 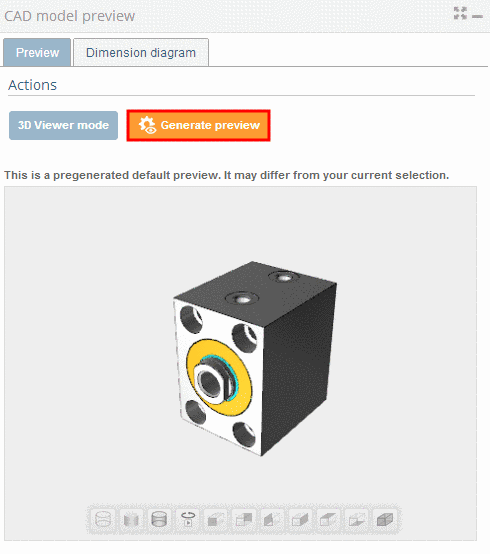 As soon as a part has been specified, the 3D preview shows up in the CAD model preview area CAD model preview. A pregenerated default preview is shown, which may differ from your current selection. If you want to see the fitting 3D view, that matches your characteristics, click on Generate preview in the Actions dialog ara. Die Darstellung wird im Fenster mittig eingepasst.